I wrote this with Darrall Thompson recently for a Pearson ACODE award (for which REVIEW was ‘Highly Commended for Innovation in Technology Enhanced Learning’, although other very worthy projects took the prize), and think it’s worth sharing! Single-mark or grade indicators are commonplace in describing student performance, leading to a tendency for both students and staff to focus on this single indicator, rather than more nuanced evaluation of a student’ knowledge and attributes (Thompson, 2006). Moreover, such assessments cannot provide feedback regarding the development of knowledge and other attributes across disciplinary boundaries and years of study. Providing a self-assessment space, to encourage students to reflect on and articulate their perception of their own achievements, which they can compare to tutor-assessments that target written formative feedback at the criteria in which there is the largest gap between the self-assessment and tutor-assessment. To make explicit the association between: assessments (including exams); graduate attributes; the marks given; and specific feedback (such that two identical ‘grades’ can be composed from multiple different criterion-level assessments). Through ‘2’, to act as a change agent in developing and shifting assessment tasks and criteria towards constructive alignment between individual assessments – perhaps most notably examinations – and higher level graduate attributes. Led by researchers at the University of Technology Sydney (UTS), the tool has been evaluated against these objectives over a period of 12 years. Early evaluations (Kamvounias & Thompson, 2008; Taylor et al., 2009; Thompson, Treleaven, Kamvounias, Beem, & Hill, 2008) indicated that (1) based on student feedback surveys, they had generally positive experiences in using the tool, specifically that it enhanced the clarity of the assessment expectations, and (2) based on instructor reflections and analysis of unit outline changes, the tool was a driver for change in developing explicit assessment criteria and constructive alignment between assessments and graduate attributes. REVIEW’s impact is seen across whole cohorts of students, in multiple disciplines, and institutions. From initially being deployed at UTS, the REVIEW software has been adopted by: The University of New South Wales (UNSW); Queensland University of Technology (QUT); The University of Sydney; and – in developing pilot work – schools in both the UK and Australia. This external adoption forms a part of REVIEW’s impact at scale, demonstrating its reproducible impact on enhancing student learning, and (as we discuss further below) providing a sustainable model for its continued development. Within these institutional contexts, the tool has growing adoption amongst academics. Indeed, its impact can be seen in the – largely organic – growth, with coordinators finding the tool helpful to engage their tutors with the tool to support a unified approach to student feedback. 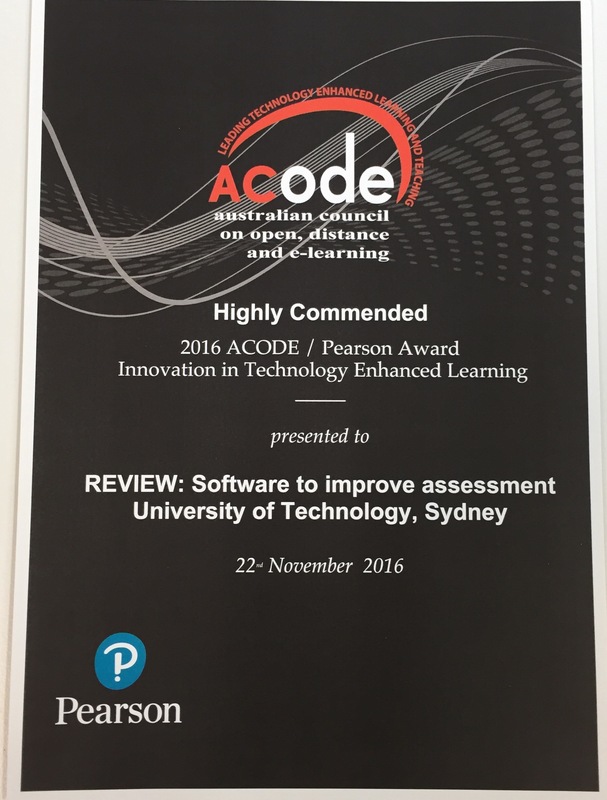 For example, at UNSW, a 2011 trail of REVIEW with four courses, has expanded to 160 courses using the software each semester across three faculties, “[i]t was found that the use of Review improved learning, teaching and assessment administration and reporting outcomes” (Carroll, 2016). REVIEW facilitates a ‘bottom up’ approach to assessment innovation (Cathcart, Kerr, Fletcher, & Mack, 2008; Thompson, 2009). That is, rather than academics developing individual approaches, or required to align their existing unit outlines and activities within them to proscribed graduate attributes, they use a facilitative tool to make explicit the aims underlying their assessment tasks. This process often leads to more scenario-based questions to test the application of knowledge in examinations (Thompson, Forthcoming). Because of its mode of action, instructor (or departmental) adoption has an impact on all students enrolled in their courses – as such, all students in classes which use REVIEW are impacted by the increased focus on making assessment criteria explicit, articulating relationships between assessment criteria and graduate attributes, and drawing constructive alignment between these factors. The REVIEW tool is explicitly targeted at building capabilities; both of students, and the academic staff and tutors who work with them to develop their graduate attributes. As such, REVIEW is targeted at building capability in criterion-based assessment, and understanding of the application of these criteria – by both students and assessors – towards high-level graduate attributes, which the system foregrounds thus facilitating change favouring constructive alignment between assessment tasks and these goals. The system has won adoption through its ease of use and range of visual feedback, alongside – for instructors, and administrators – a range of reports offering value for course mapping, the benchmarking of sets of tutor assessments (e.g. to explore discrepancies in tutor marking), accreditation and assurance purposes, and monitoring changes in subjects over different deliveries. The reports are then used as discussion tools, to support professional development between tutors and instructors (Thompson, Forthcoming, p. 16). In addition, the software has facilitated course-reviews, through providing reporting on the mapping of assessment criteria to graduate attributes. These reports can, for example, reveal that some Course Outcomes are not in fact mapped to assessments, again opening discussion around assessment and outcome designs (Thompson, Forthcoming, p. 19). Some impetus for use of REVIEW has come in one Faculty from the mandate that graduate attribute development be reported on by course teams, with REVIEW validated as a system to provide such evidence. Moreover, though, engagement goes beyond ‘box ticking’. The software facilitates and enhances an approach to criterion-based and self-assessment, but its implementation has been developed with a set of resources to guide academics in creating discipline-specific language to describe intended learning outcomes and their application to assessment tasks and criteria. It is thus a key facilitator of formative assessment both as an agent for change, and in terms of its scaffolding capabilities – emphasising criterion-assessment, and targeting feedback at those areas in which a student’s self-assessment is least accurate. A key facilitative feature in the software has been the ‘visual grammar’ which threads through course documentation and the REVIEW software. In DAB a memorable acronym, colour-set, and symbol has been developed to foreground each category to staff and students: CAPRI. CAPRI comprises the graduate attributes in the faculty: Communication and Groupwork; Attitudes and Values; Practical and Professional; Research and Critique; Innovation and Creativity. These attributes are then foregrounded in REVIEW, which is used to collect marks in the background from the day-to-day marking of assessment criteria linked to both Course Intended Learning Outcomes and the five CAPRI categories. Top-down directives about graduate attribute integration often involve onerous documentation, alienating busy academics while having minimal impact at the student level. For improvement in feedback to occur, instructors need to be given timesaving strategies and support. Software such as REVIEW must be integrated into the main university system to save time in assessment and reporting processes. The timesaving aspects and ease of use of REVIEW together with its perceived value to staff and students caused it to spread by osmosis, leading to its commercialization by the University of Technology Sydney in 2011. University technology divisions require highly secure systems that do not compromise their existing services. There are a number of approaches for web-based systems hosted internally by each university or externally by a provider. The developer’s recommendation is for REVIEW to be externally hosted and undergo rigorous penetration testing with every upgrade release. However, an internally hosted option is available. The configuration of the system and Application Program Interface (API) integration is essential for broad adoption, together with policy approvals by faculty boards, heads of school, and course directors. REVIEW features are continuously upgrading due to a collaborative funding model that enables universities that require a particular feature to pay for it to be included. For example, the Assurance of Learning reporting system illustrated in Figure 9 was funded by the University of New South Wales (UNSW) because of their requirement for Business School accreditation by the AACSB (Association to Advance Collegiate Schools of Business), and EQUIS (European Quality Improvement System). They have used this module in REVIEW extensively for their successful and continuing accreditation processes and maintain that previous methods of collecting and compiling data for these reports was onerous and time-consuming at the most highly pressured times of the year. REVIEW has automated this process with a level of granularity that has assured its adoption across a number of faculties. The collaborative funding model is a progressive format that enables such Assurance of Learning and other modules to be available for any other user of REVIEW free of charge. Shared or individually funded features are specified, and costs are then estimated by the software developers in Sydney. Extensive modules together with smaller features are implemented with ongoing upgrade versions. There is a REVIEW Users Group (RUG) jointly run by UNSW and UTS as both an academic and technical forum for ideas, feature requests, and upgrade presentations. The REVIEW tool has been adopted across multiple disciplinary and institutional settings. The tool provides flexibility in terms of the specific functions that are deployed in each setting, and how they are expressed. For example, REVIEW can be used in disciplinary contexts requiring accreditation by professional and educational bodies. In business faculties at three Universities (UTS, UNSW, QUT), an ‘Assurance of Learning (AOL)’ module has been introduced for this purpose. Multiple institutions have adopted REVIEW, shared their practices, customisation, and ‘wish lists’ for features (see ‘sustainability’). The development of REVIEW features has been driven by users, and is testament to the value academics see in its use. A key set of resources has been developed across this work, to support both students and staff in use of REVIEW, and their understanding of criterion-assessment, peer and self-review, and graduate attributes. As part of the commercialisation process (see ‘sustainability’, the original REVIEW code was converted from Flash to HTML 5, by a small external developer. This development was funded using a collaborative model across institutions, allowing the development of modules (such as the UNSW Assurance of Learning module) that other institutions now have available to them. This model has thus seen a sustainable and reproducible means to achieve enterprise level implementation of the REVIEW tool. The commercial website (http://review-edu.com/ see ‘sustainability’) gives some guidance to instructors, although further funding could support the transition of resources to ‘open license’ materials to be shared through a key repository. Similarly, REVIEW continues to be researched and developed, to build its capabilities and ensure that it can be adopted across contexts. Further funding would support this work; for example, a schools pilot is currently being planned in both the UK and Australia. This pilot affords potential for new research and development avenues, while also requiring a different kind of support to the materials already developed. We are also actively planning a project to investigate the quality of the qualitative feedback that students receive, and the quality of their own reflections, when using REVIEW. That research will extend REVIEW to support staff and students in identifying and giving high quality feedback – particularly important given the pedagogic value of students giving feedback in peer-assessment contexts. Boud, D., Lawson, R., & Thompson, D. G. (2013). Does student engagement in self-assessment calibrate their judgement over time? Assessment & Evaluation in Higher Education, 38(8), 941–956. Thompson, D. (Forthcoming). Marks Should Not Be the Focus of Assessment — But How Can Change Be Achieved? Journal of Learning Analytics. Thompson, D., Treleaven, L., Kamvounias, P., Beem, B., & Hill, E. (2008). Integrating Graduate Attributes with Assessment Criteria in Business Education: Using an Online Assessment System. Journal of University Teaching and Learning Practice, 5(1), 35.